The blockchain is like layers in a geological formation — the deeper you go, the more stability you gain. Editor’s note: this is an excerpt from Chapter 7 of our recently released book Mastering Bitcoin, by Andreas Antonopoulos. You can read the full chapter here. Antonopoulos will be speaking at our upcoming event Bitcoin & the Blockchain, January 27, 2015, in San Francisco. Find out more about the event and reserve your spot here. 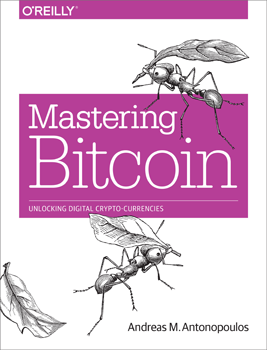 View more chapters from Mastering Bitcoin here. The blockchain data structure is an ordered back-linked list of blocks of transactions. The blockchain can be stored as a flat file, or in a simple database. The bitcoin core client stores the blockchain metadata using Google’s LevelDB database. Blocks are linked “back,” each referring to the previous block in the chain. The blockchain is often visualized as a vertical stack, with blocks layered on top of each other and the first block serving as the foundation of the stack. The visualization of blocks stacked on top of each other results in the use of terms like “height” to refer to the distance from the first block, and “top” or “tip” to refer to the most recently added block. Each block within the blockchain is identified by a hash, generated using the SHA256 cryptographic hash algorithm on the header of the block. Each block also references a previous block, known as the parent block, through the “previous block hash” field in the block header. In other words, each block contains the hash of its parent inside its own header. The sequence of hashes linking each block to its parent creates a chain going back all the way to the first block ever created, known as the genesis block. Although a block has just one parent, it can temporarily have multiple children. Each of the children refers to the same block as its parent and contains the same (parent) hash in the “previous block hash” field. Multiple children arise during a blockchain “fork,” a temporary situation that occurs when different blocks are discovered almost simultaneously by different miners (see “Blockchain Forks”). Eventually, only one child block becomes part of the blockchain and the “fork” is resolved. Even though a block may have more than one child, each block can have only one parent. This is because a block has one single “previous block hash” field referencing its single parent. The “previous block hash” field is inside the block header and thereby affects the current block’s hash. The child’s own identity changes if the parent’s identity changes. When the parent is modified in any way, the parent’s hash changes. The parent’s changed hash necessitates a change in the “previous block hash” pointer of the child. This in turn causes the child’s hash to change, which requires a change in the pointer of the grandchild, which in turn changes the grandchild, and so on. This cascade effect ensures that once a block has many generations following it, it cannot be changed without forcing a recalculation of all subsequent blocks. Because such a recalculation would require enormous computation, the existence of a long chain of blocks makes the blockchain’s deep history immutable, which is a key feature of bitcoin’s security. One way to think about the blockchain is like layers in a geological formation, or a glacier core sample. The surface layers may change with the seasons, or even be blown away before they have time to settle. But once you go a few inches deep, geological layers become more and more stable. By the time you look a few hundred feet down, you are looking at a snapshot of the past that has remained undisturbed for millennia or millions of years. In the blockchain, the most recent few blocks may be revised if there is a chain recalculation due to a fork. The top six blocks are like a few inches of topsoil. But once you go deeper into the blockchain, beyond six blocks, blocks are less and less likely to change. After 100 blocks back, there is so much stability that the “coinbase” transaction, the transaction containing newly mined bitcoins, can be spent. A few thousand blocks back (a month) and the blockchain is settled history. It will never change.